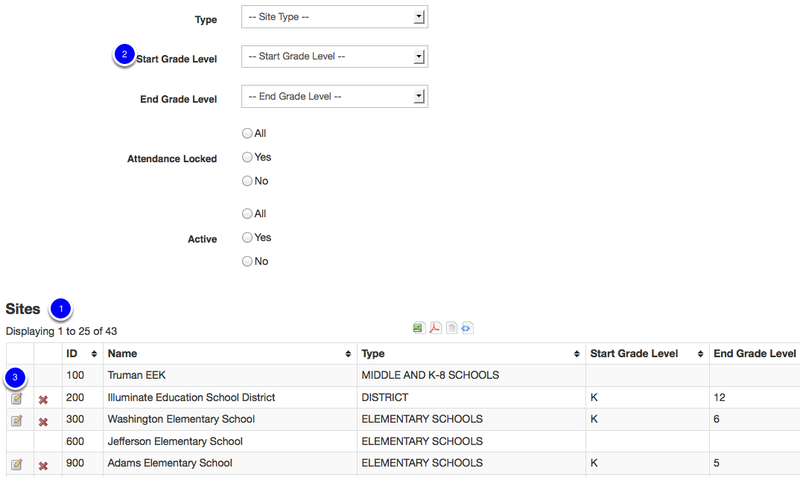 After the initial district setup and at the start of each school year verify that site information is accurate for each site within the district. 1. Go to the Administration Gear. 2. Under School, select Site Management. A list of site names will appear at the bottom of the page. 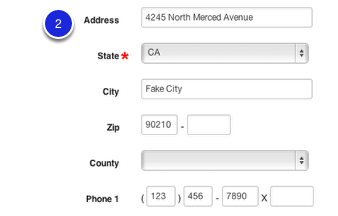 For particularly large districts the filters found at the top of the page are useful to limit the site list. Click on the edit Icon to see basic setup details for the site. Basic information about the site was collected upon setup. This information should be verified and additional information should be added for more complete details. Verify that the Site Name, State Site ID, School Type, and Start and End Grades and if applicable Transcript Grade Levels are correct. Add in the Principal name so that it generates on Report Cards accurately. State Site ID: Must be the complete State Site ID. For example, in CA, this is the CDS code, which should include the complete 14 digit CDS code. In cases where sites have been split by type multiple sites can have the same CDS codes. Parent Site: Parent Site for a school should be the district in most cases. If you make another school the parent site to a new school you are making, you will encounter issues using the student scope selector in Illuminate pages and reports that searches for student data. Principal Name: This will display on Report Card. Start Grade: The lowest grade offered at this school. End Grade: The highest grade level offered at this school. Middle School Transcript Grade Levels: If this is a MS, what grade levels should be included into the Transcript? (Grades > Transcript - Middle School). High School Transcript Grade Levels: If this is a HS, what grade levels should be included into the Transcript? (Grades > Transcript - High School). If additional additional grade levels are needed that were not included in the site.txt file please contact Illuminate to add them. For CALPADS purposes please include a grade level of TK and Illuminate will translate all students with a grade of TK to a TK program for the SPRG file extract. 2. Verify that the Address is correct as optional additional classifications about the school can be added at this point as well. CEEB Code: CEEB Code that will appear on HS Transcripts. Title 1 Math and Reading: Used for CALPADS as a way to record site wide Title 1 instead of adding to each student individually at the program level. Users must check one and/or the other if this school is indeed a Title 1 school. Has Students: Set to no for inactive schools. 3. Verify that the Has Students option is set to yes for any school that is open and set to no for any school that is closed. 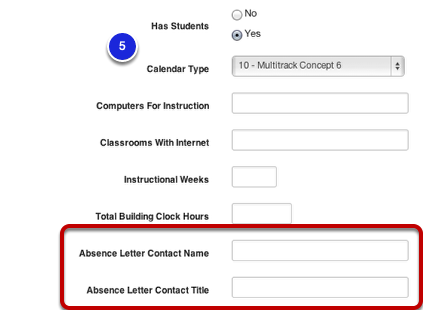 Fill in any additional information and note that the Contact Name and Title provided here is what is printed on Absence Letters found in the Attendance module. Note that Calendar Type is a deprecated field and is not supported at this time. Apply changes and select Save. 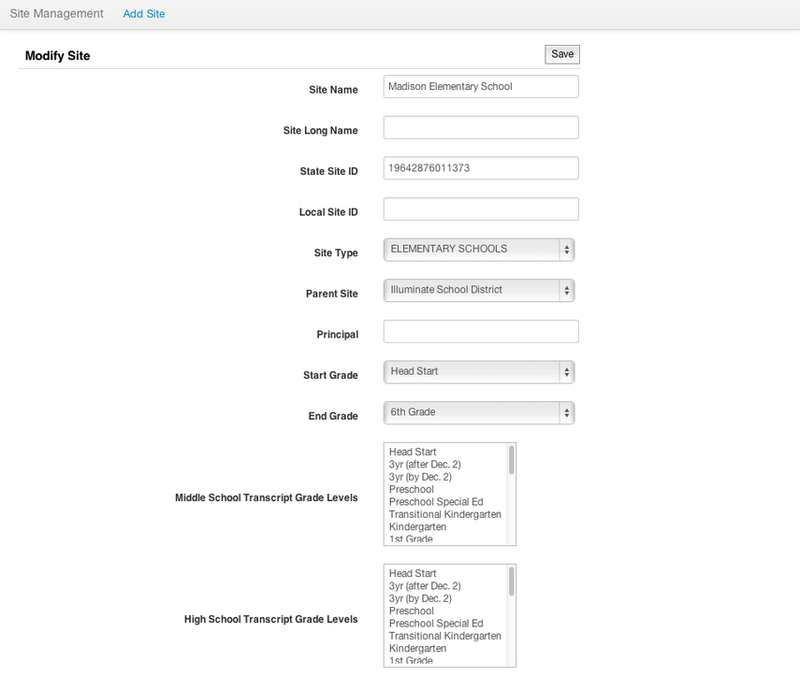 Now, lets get started on 1.3 Create and Edit Timeblocks and Occurrences (Periods and Bell Schedule).